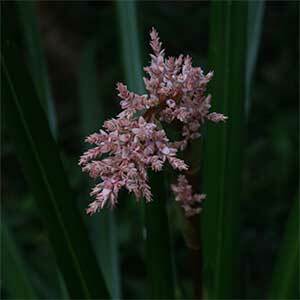 A clump forming perennial, Helmholtzia glaberrima is commonly called the Stream Lily. Originally from Queensland and Northern New South Wales where it grows along waterways, this is a plant that will grow well in cooler climates given protection from frosts. Grown for the attractive flowers which appear on short stems, Helmholtzia glaberrima also has good glossy green foliage. This is a plant to grow next to pond or stream in shaded conditions where it will thrive with minimum care. A humus rich moist soil is essential, as is dappled shade. It will grow away from waterways as long as the soil is humus rich with some moisture. The only pruning that will be required is to remove old foliage and spent flower heads. You can prune back hard to just above the ground in spring if you wish to revitalise the clump. Propagation is from seed and by division of established clumps. Position – Shade to Part Shade. Spread – Around .75 metres ( 2 ft).